Ionel Talpazan thought he saw a UFO when he was a boy, and never stopped seeing them. Of course, he created them. Ionel Talpazan was 60 years old when he died this week, of diabetes and stroke. He was a boy in a small village in Romania, given up by his parents and raised by a succession of foster parents. He told interviewers he escaped into the woods one night because he thought he would be beaten. He saw a blue, beating light in the sky above, and was sure it was a spacecraft. 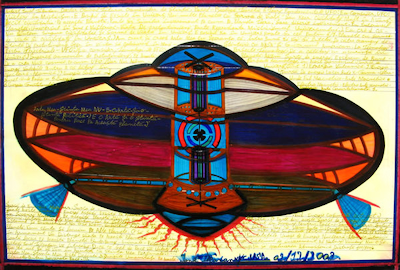 Ionel began to draw spacecraft; I'm not sure you can call them UFOs when an artist gives them such a vivid, colorful identify. Budd Hopkins Memorial: "Lovely Affair Celebrating the Life and Work of this Wonderful Man"